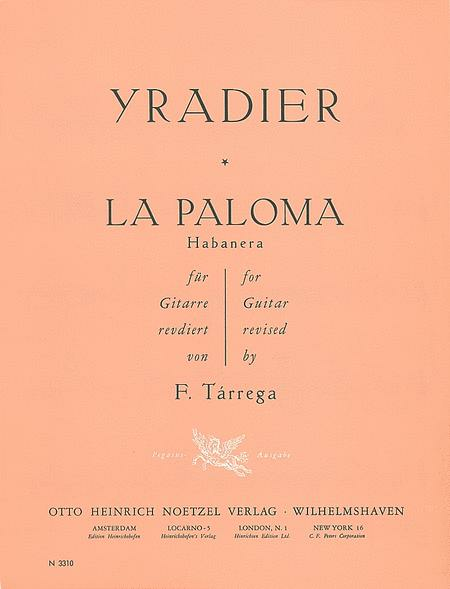 (Habanera) Transcription by Francisco Tarrega (1852-1909), composed by Sebastian Yradier (1809-1865). For classical guitar. Format: guitar solo single. With standard guitar notation and fingerings. Romantic Period. D Major. 2 pages. 9x12 inches. Published by Heinrichshofen Verlag. With standard guitar notation and fingerings. Classical Period. 9x12 inches. Composed by Sebastian Yradier (1809-1865). Arranged by Murray Houllif. Published by Kendor Music Inc (KN.20143). By Sebastian Yradier. Arranged by Hans-Gunter Heumann. For piano. Published by Lemoine. By Sebastian Yradier. Arranged by S. Papas. Published by Columbia. By Sebastian De Yradier. Edited by Andersen, Ludwig. For High Voice and Piano. German - French - Spanish. Edition Schott Einzelausgabe. 8 pages. Published by Schott Musik International. By Peter Pickow (Editor) ; Amy Appleby (Editor). For Piano. Romantic, Classical. Sheet Music. 320 pages. Published by Music Sales. Edited by Amy Appleby. For piano. Format: piano solo book (spiral bound). With fingerings. Renaissance, baroque, classical period, romantic period, impressionistic and 20th century. 400 pages. 9x12 inches. Published by Amsco.